Wizards of the Coast announced today that the upcoming Magic expansion Guilds of Ravnica will be joined by a new sourcebook for Dungeons & Dragons called Guildmasters’ Guide to Ravnica. Inspired by the lore of Ravnica from Magic (the setting has appeared in multiple past expansions to Magic before its return later this year), the Guildmasters’ Guide will contain all the rules and inspiration Dungeon Masters would need to run a D&D campaign in the Eastern European-inspired techno-magical metropolis of Ravnica, as well as details on the rival guilds that vie for control of the vast city. Is that a printed book, or another DM's Guild release like the Eber-whatsit one that just came out? It will be a Book. Guildmasters’ Guide to Ravnica is set to release on November 20, after the Guilds of Ravnica expansion for Magic launches October 5. I could careless about this book to be honest. Figured I would share the info for any D&D and Magic The Gathering Players here. That's not confirmation it's a printed sourcebook. As I said, they just released an Eberron pdf to the DM's Guild. Well it's available to order from Amazon, and is listed as a hardcover book on the Wizards of the Coast website. RENTON, WA. – July 23, 2018: Wizards of the Coast is psyched to announce the first collaboration on a major product between Dungeons & Dragons and Magic: The Gathering with Guildmasters’ Guide to Ravnica releasing everywhere on November 20. The book will contain everything fans need to play D&D in the world-spanning city of Ravnica, the fan-favorite Magic setting populated by ten rival guilds, each with its own ethos and agenda. Fair enough. I was at work when I commented earlier; I didn't think to check the Amazon and the Wizards site is blocked (and the block isn't as easy to circumvent as it used to be!). Yeah. The Ravnica setting book is a printed hardback book, so it's an officially sanctioned publication for 5th Edition. The Wayfinder's Guide to Eberron is currently a DMs Guild product, and it's stated that it is an "evolving" playtest material, which is kinda like Unearthed Arcana…… playtest material which will likely end up as a final hardback 5E setting publication that costs like $50. The main difference is that all previous Unearthed Arcanas were free-to-download PDFs. The Eberron book, on the other hand, is a playtest book that they want you pay $19.95. Seeing the little information the Eberron guide has, yeah, the SCAG is the CS. • Size: The Plane of Ravnica is immense. It's one giant city/urban world (think of Coruscant from Star Wars) in which life, death, and magic thrive and permeate the very essence of the world. From the Steam Vents of the Izzet League to the Simic Breeding Pools. The Underground Tombs of the Golgari Swarm to Hallowed Fountain of the Azorious Senate, these are places of great power and from which, exude great fonts of magic. The view from the Spires is pretty amazing and gives a great visual of what the plane is all about! • Diversity: Ravnica is in no short supply of a host of races and animals. From the mundane humans and elves to the more exotic Minotaurs, Loxodon, Dragons, and Vampires. Spirits roam the streets, still carrying out services owed to the Orzhova Syndicate and from the depths of the undercity lurk the creatures devoted to House Dimir. I'd say it's pretty easy to find a niche for any races currently in the PHB that fits nicely into the setting. - Azorious Senate: (magic colors U/W) are the law makers and policy creators of the Plane. Their duty is to ensure that the Guildpact is always upheld and to put forth impartial judgement when other guilds fight and settle disputes. - Boros Legion: (magic colors R/W) If Azorious are the law makers, then the Boros Legion is the peace keepers. They're the foot soldiers and warriors that carry out the fighting in keeping the Guildpact intact. They're also extremely devoted to the Angelic host of Razia (and later Feather) whom take one the responsibilities of the Boros Legion. - Cult of Rakdos: (magic colors B/R) Where there are heavenly angels singing upon high, there are demons dwelling in the dark. The Cult of Rakdos is chaotic, evil, and destructive in nature. They get by as one of the few guilds who's paid to demolish and destroy areas that are of no more use. When they're not destroying stuff for gold, they're holding elaborate underground parties where blood flows (and is sometimes consumed) like wine. They revere Demons in all their terrible forms. - Golgari Swarm: (magic colors B/G) In the areas where fungus and the decomposing world festers, life is found. Harvested and maintained by the Undead, the Golgari use their necromantic powers to create and grow life, completing the circle. They're one of the guilds who grows a significant portion of the Plane's food and do so pretty much unimpeded. Though their main practitioners are Dark Elves (and I use that term as it applies to MtG, not Drow like in D&D) they have good report with other top-world guilds, even if it's a strained relationship. - Gruul Clans: (magic colors G/R) These represent the feral and warlike clans of the outer cities. Using what's left and discarded by the privileged, they've carved out their name as a dangerous enemy to cross. These barbarians still have uses though, especially in recruiting when skirmished between guilds occurs. The question is, who has the right price? - House Dimir: (magic colors B/U) Simply put, this guild *does not exist*, except that it does and exceeds in doing so from the shadows. If you want information from a rival guild, you use a Dimir infiltrator. Want someone killed, use a Dimir Assassin. Need to slip into a place undetected, the Dimir can help with that. Unfortunately the price might be too steep and they always collect, it's the way of a Vampire you know? - Izzet League: (magic colors U/R) Explosions, grandiose magic, lights-colors-sounds, and a flair for the dramatic is what the Izzet league aspires to be. This guild of arcane wonders are the inventors and creatures of Ravnica. They work tirelessly to find fun, unique, and....often destructive means to fuse magic and technology together. If there's a new gadget on the market, chances are it was made by the Izzet. They're master is a highly intelligent and very respected Dragon named Niv Mizzet and he runs a tight ship despite the unfortunate accidents that occur. Such is the way of science! - Orzhov Syndicate: (magic colors B/W) If you ever wanted to see what a mob-based guild would look like in D&D, this is your chance. The Orzhov Syndicate is a law-binding guild that makes contacts and breaks deals....for a price. Usually this entails the contractual slavery of your immortal soul. They're always looking to make money and they don't care if you die in the process. - Selesnya Conclave: (magic colors G/W) This is the quintessential "fantasy" guild. Headed by elves and fey beings, they attempt to restore nature to it's rightful place among a plane that's so far removed from the natural wonders. They're main concerns are protecting the ever-shrinking groves of the natural world and finding new ways to fuse nature with the mechanized and modern world they've come to live in. Their lands are easy to spot as it's usually covered with grass or hiding in the few remaining trees that dot the city. - Simic Combine: (magic colors G/U) This guild's main purpose is to genetically alter what nature they can to better adapt to the world of stone and technology. They strive to absolute control over both the physical and metaphysical aspects of the real. Their weird science experiments are also lethal. Hope that helps better flesh out the intricacies of Ravnica. I'd also suggest getting the 3-part series of Ravnica novels. They're a really good read. Welcome! I really enjoy Ravnica as it pertained to the magic cards because it really opened the flood gates to multicolored cards and off-colored combinations like red/blue, green/black, etc. The setting itself is really cool, so much so that I started to make a 4E campaign around it. It worked out well until 2 players moved away. I realize that the Magic setting has some good ideas (to contribute to D&D gaming). But those stupidly long pointy Elven ears is not one of them. They're cartoonish. However, some very good ideas have come out recently from MTG that I'd consider using for my D&D (mostly Forgotten Realms) campaign. One great concept idea was the Dusk Legion in the Ixalan setting. Ixalan, for those not familiar with MTG, is the setting that contains a Mesoamerican-like continent, much like Maztica. So the natives are similar to Aztecs/Mayas, with their great pyramids, etc. The natives also ride dinosaurs (which is kinda like Chult). One of the "bad guys" of the Ixalan setting are the Dusk Legion, which are European-ish human-vampire conquistadors. Most of them are not full vampires, they are more like Daywalkers (dhampirs), so they can walk among the normal humans, etc. In fact, only the hereditary nobles of the Dusk Legion have vampiric ancestry, the rest of them (in the hundreds) are normal human henchmen thugs and corsairs that swear loyalty to the vampiric noble house. The Legion dresses in typical Spanish Conquistador armor, plumed helmets, fancy sabres, etc. They also arrive into Ixalan via their huge caravels and galleons. Why do the vampire-led Legionnaires want to explore and conquer parts of Ixalan? It's obvious. They need a steady supply of warm-blooded victims for their vampire lords to feed on. Plus, it's also an added bonus that they can capture and enslave the native Ixalans. Vampires and the demi-vampire nobles will not do any menial work. That's what their thralls, human henchmen, intendants and slaves are for. I'd actually think about doing this for my 5e Forgotten Realms campaign, where a Tethyrian (or maybe Amnian) noble house with vampiric bloodline has ambitions to become "conquistadors in Chult". That's only some planes though. I direct you to the amazing and awesome Eladamari, Lord of Leaves of Dominaria! So my buddy got a copy of the book earlier last week and let me borrow it. And I have to say, I thoroughly enjoyed the book. It really lets you get immersed into the setting. It spends a great deal talking about the Guilds, how they work with specific classes, and what their views are of other guilds and overall outlook. It details a few new races: Loxodon, Centaur, & Vedelkin and adds in Goblin and Minotaur too. It has 2 new class option (Order Domain & Spore Druid) as well. It has a few magic items that factor into the lore of the world. All in all, it's 250+ pages, dealing mostly with the 10th district of the Plane. It has a small map that lays out the city proper but the book states that the Plane is much more vast in scope, which to me means it allows for a lot of room to add in your own stuff in as you see fit. I've ordered that and the Undermountain book from the Amazon; they should be arriving this day. That's awesome. I hope you like it. Ravnica is my favorite Mtg setting and I feel they did a good job overall. I wish they incorporated more mechanics from the cards, maybe in Feats or some new feature, but I get why they didn't (extra bloat = more chances for brokenness) but that means more homebrew ideas for me. I got it and started reading it, this day. Kinda eager, on this one -- I avoided the Magic craze, so this is all totally new stuff to me. Well the setting is about 80% fluff in regards to the D&D game mechanics. None of Magic: the Gathering game effects transfer over, so you don't need to understand the MtG game to enjoy the setting. 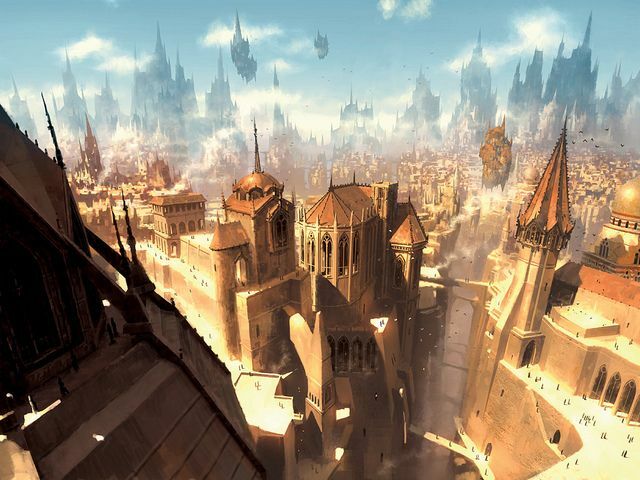 So the whole Ravnica setting is just one city? I gotta say this is one of the things that feels weird to me. I bought two of their art books (Amonkhet and Ixalan). I loved the imagery in Amonkhet but the story felt weird because it was all about a single city as well. That being said, if these weren't prime worlds, I can totally buy it, because one of the things I did like in 4e was that the outer planar domains had specific dimensions. Granted, we may not have known the full breadth of a plane, but we were pretty sure that it did end, especially if someone ruled it. Well yes and no. The way to look at it is similar to Star Wars planet Coruscant. Its the size of a planet but the planet is a giant city. The book states that the plane is so vast no one knows if there's an end? The book also details one very small area, albeit a popular one called the 10th District. This, along with the other 9 distric, make up the "core" area (meaning it has significance in the setting and lore). Outside of that is a DM paradise that is open to your imagination. Now one might think "how are there any natural structures so integral to magic: the gathering?" In terms of magic, using Forests or Mountains to cast spells etc. For Ravnica, nature has found its way but it's....changed. For example they have rivers and waterfalls and in certain areas many plants and vegetation grows and huge swathes of dilapidated and destroyed buildings make up natural mountainous obstacles. For inspiration, I'd use the Lands taken from the sets to help with the imagination. What I find myself doing is taking old adventures and converting them to be used in Ravnica. 4e's Keep on the Shadowfell is going to be a 5e Ravnica adventure called Node to the Horrors of Phyrexia and I'm using the hooks and plot and changing it to 5e.